While checking and updating the club’s first aid kit, I found a watch in one of the backpack’s pockets. This is likely from either the races, clinic, or maybe GAF last year? I’ll try to remember to bring it with me to the meeting, or contact me and I’ll get it back to you. I’m really sorry to miss it, but I think we’re going to stay home. Sorry for bailing at the last minute, just not sure about the weather with the kids. Hope you all have a great weekend!! Our family will be there (2 adults, 2 kids). I think we will come down late Friday evening. 1030 ish. Running a few minutes late. The badge requirements suggest that this is 15-20 hours of instruction, in addition to a trip on a class I-II river. There is a community center in Valley Park, William Brignole Center. St Louis Canoe and Kayak club has their meetings there. I don’t have any contact information, but maybe they’d work with Ty if it’s available. Those were monster waves. I’m glad you all were ok!!! Thank you for sharing, Curtis. Kathy, the American Whitewater site shows it as below recommended. It says the Little Saint Gauge should be 4-7 and has it at 3.14. I don’t know if it’s doable still at this level or not. I guess you could do the Upper as a back up. Never mind, something came up. Will there be age group sub-categories for long and short boat classes? Or only 3 classes total? Bump!! The deadline is approaching. Jacob had a blast at our first pool session, so now I’m in the market for a small kid size boat and paddle. Looking for a fun 1 or sidekick. Let me know if you’ve got one you’re interested in selling. 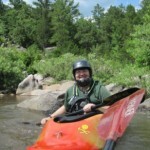 Did you share on St Louis Canoe and Kayak site too? Such a great man, and such fun to be around. I just can’t believe this….